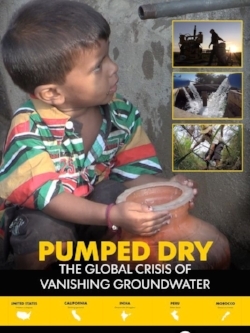 The 2016 Breck Film Fest hosted a screening of Elfers' Pumped Dry: The Global Crisis of Vanishing Groundwater,which takes a close look at supplies of groundwater that are rapidly vanishing across the globe. As aquifers decline and wells go dry, people are being forced to confront a growing crisis. I came to filmmaking through photojournalism. A career in photography turned into video and editing and on to modern multimedia like VR and 360 video. Naturally curious, I was drawn to the power of storytelling through documentary film. A great film should move you emotionally. It should make you feel something. In documentary film, character and exposition are used to inform and invest the viewer. A successful documentary should not just inform the audience, but make them care about the subject and move them to action. That’s a long list! The documentaries that stand out are the ones that reveal something never seen before. The Cove, 5 Broken Cameras, Inocente, Born Into Brothels, The Act of Killing are all recent favorites. Getting started is not as hard as it used to be. The tools and techniques have never been more accessible. You need to add passion, commitment and persistence. Collaborate with others who have skills you don’t. Great stories motivate me and I’m always looking for the next one. The story is finished when you run out of moments. Your character has overcome and transformed…all the layers have been peeled and there’s nothing left to say! I have produced on six full-length documentaries and numerous short-form videos. The subjects have been varied, but my favorite are the environmental topics. PUMPED DRY focused on global groundwater. I also produced a series of short videos on global warming in Alaska that were a satisfying challenge. As Managing Editor of Multimedia for USA TODAY, I get to work with some amazing investigative reporters who are always on good stories. “GONE” is one of those projects. Jerry Mitchell is a friend and investigative reporter from Jackson, Mississippi who broke the oldest serial murder cold case in U.S. history. I covered the trial and traveled to Texas where the arrest was made. I love shooting because it was my first passion and editing because it extends the creative process and brings it all together in front of you on the timeline. But the most satisfying is positive audience reaction. If they were informed, delighted or moved, then I’m pleased. I figured that the kind of people who choose to work and live in place as beautiful as Breckenridge have a passion for the environment. PUMPED DRY tells the story of a phenomenon hidden to most of us…the depletion of major world aquifers. Stories happen to people, not things, so we bring the film to life by introducing you to families from Kansas, California, Peru, Morocco and India who are living above this dilemma. I had some memorable conversations and look forward to working with or visiting some of the friends I made. I certainly need to get to Breckenridge when there’s snow in the mountains! The business is a challenging one. The old adage is, “If you want to do documentaries, keep your day job!”. Find a worthy idea, develop and research, align sponsors, funding, distribution…and don’t forget to shoot and edit something beautiful, memorable and inspiring! Focus on telling great stories and the rest gets easier. Most of the films I have worked on have been done as works of journalism. I have secured grant money to support productions by partnering with institutions who’s missions align with the projects topic. For PUMPED DRY, which showed in the 2016 Breckenridge Film Festival, the Pulitzer Center was an outstanding partner who covered overseas travel costs and turned the film into curriculum for elementary through university students. I work at USA TODAY, where I am the managing editor of multimedia. We have been doing some cool things with VR. You can see them in a mobile app called VR Stories or on YouTube in a show called “VRTually There”. Last year we published the story of the oldest serial murder ever to come to trial in the U.S. called “ GONE” with 5 short documentary chapters. At the front end, I think crowdfunding is the most intriguing development to build interest and raise money. On the distribution end, Netflix, Amazon, Hulu and others are making documentaries more accessible. That said, anything that helps great and important stories get produced and distributed is welcome and needed.